THE COURIER	SUNDAY. JULY 5, 1908. Norman Elberfeld, Griffith's Successor, a Scrappy and Aggressive Player. The passing of Clarke Griffith as manager of the New York Americans will go down as one of the sensations of baseball this season. Here was what we may term an 18 carat ball player, one who knew all the angles and tricks of the game, still he was not a success as a manager, all of which goes to show that the best ball player does not always make the best leader. 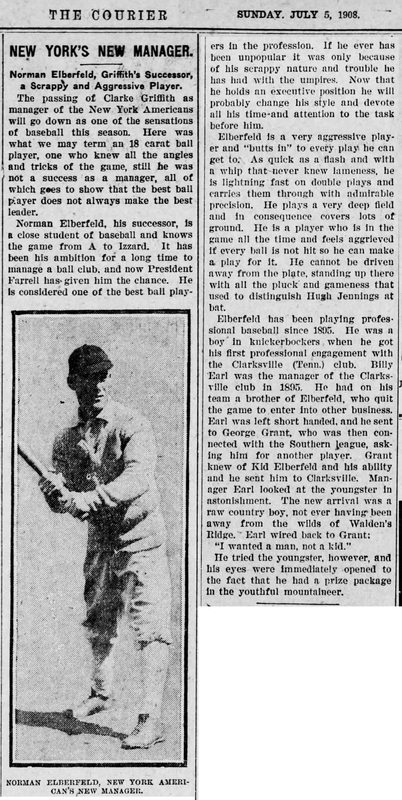 Norman Elberfeld, his successor, is a close student of baseball and knows the game from A to Izzard. It has been his ambition for a long time to manage a ball club, and now President Farrell has given him the chance. He Is considered one of the best ball players in the profession. If he ever has been unpopular it was only because of his scrappy nature and trouble he has had with the umpires. Now that he holds an executive position he will probably change his style and devote all his time and attention to the task before him. Elberfeld is a very aggressive player and "butts in" to every play he can get to. As quick as a flash and with a whip that never knew lameness, he is lightning fast on double plays and carries them through with admirable precision. He plays a very deep field and in consequence covers lots of ground. He is a player who is in the game all the time and feels aggrieved if every ball is not hit so he can make a play for it. He cannot be driven away from the plate, standing up there with all the pluck and gameness that used to distinguish Hash Jennings at bat.